We invite you to join us at the fun-filled fundraisers held to help support the Camp Odayin mission. This fun, new event at Sprecher Brewing Company in Milwaukee supports our Residential Camp and Family Camp programs in the Milwaukee – Chicago area. 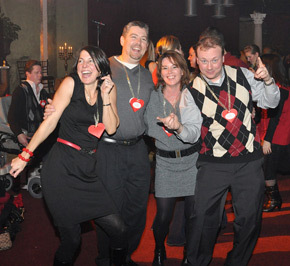 The 19th annual Have a Heart Benefit will be hosted at the Hyatt Regency Minneapolis. The Whole Heart Golf Tournament is held in June annually at Dellwood Country Club. The Heart & Sole Run/Walk features a beautiful 5K run and 2.5K walk at Como Lake in Saint Paul, MN. In addition, Camp Odayin offers FREE opportunities for heart families to connect. These events are available to all families of a child with heart disease regardless of age and whether or not a child has previously attended Camp Odayin. Enjoy a delicious dinner , splash and slide at the Tropics Waterpark, and play basketball or volleyball in the gym. Life is better when you’re having fun with other heart families! Contact us for more information on any of Camp Odayin’s events.